Like most brothers, the Chappell Brothers have different tastes. Rob prefers to live in Ontario, Canada while Chris chooses to live in Los Angeles. Their taste in bikes is different as well. Rob’s style leans more towards racing and café racers while Chris loves bobbers and choppers. 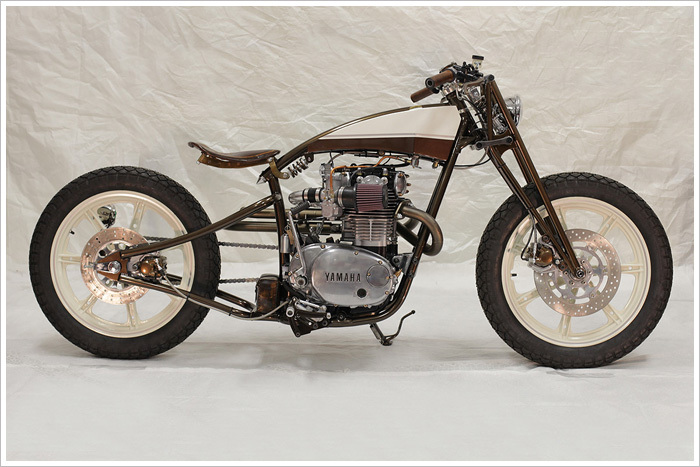 So when they decided to build their latest project they chose (after much debate) to build a bike in the middle – a board track influenced bike that would have a custom frame, traditional girder front end and tall skinny wheels. If time allowed they would also tackle their first custom gas tank! (which they did). They found the perfect donor bike in the form of a 1982 XS650 Heritage Special and got to work on this project that was really going to challenge these part time bike builders.